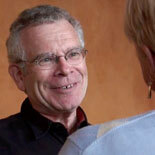 Effective Conversation with Marty Epstein helps you discover who you really are. Facilitating truth through The Work of Byron Katie is a proven way towards self-inquiry and an end to suffering from anxiety, stress, and conflict. The Work’s essential message about speaking and listening with love is not new; it appears in all the ancient wisdom teachings. What is new is a simple, profound and practical way of encouraging self-inquiry so suffering is diminished and expanded versions of your Self emerge. As a Certified Facilitator, I invite you to experience this opportunity for self-healing. Claim your accepting heart as hundreds of others have, in a series of personal sessions or as part of group facilitations. I welcome your call or email. SLIDING SCALE AVAILABLE FOR PRIVATE SESSIONS. Please contact Marty to register for this event.